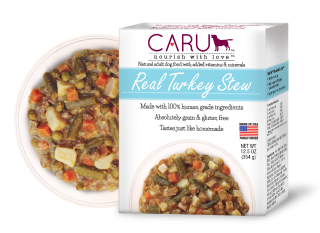 Caru Real Turkey Stew is formulated to meet the nutritional levels established by the AAFCO Dog Food Nutrient Profiles for maintenance. Serve as a complete and balanced meal or as a topper with dry food. When fed as a complete meal, use 1 pack daily for every 11 lbs. body weight. If feeding with typical dry dog food reduce dry by 2/3 cup for every 1 pack of Caru. Adjust the amount of food fed to meet your dog’s individual needs. Always provide access to fresh water.